Shop our online store through Zazzle to order products for first aid medication and emergency kit items. Because Zazzle is a print on demand company they offer a huge variety of products. Choose from buttons, stickers and key chains to label your medications and a variety of containers to store first aid supplies. Items include images of epinephrine life-saving medication to help identify where medicine is stored. These are great for attaching to children’s backpacks and first aid kits. First aid symbols and large allergy alert warning symbols help locate emergency supplies. In case of emergency please contact stickers, buttons, bags, and totes. A variety of items with an image of epinephrine devices to help locate emergency medications. Personalize and customize with name and contact information. Stickers are great to attach to medicine kits, lunch boxes, school paperwork, daycare supplies. Edit the text to personalize the text. They are available in small or large sizes, scratch-resistant front, easy peel-and-stick back in a matte or glossy finish. Keychains, luggage-style tags, and buttons are great for labeling medicine kits, bookbags or other items. Use tote bags to carry around first aid supplies and medications for kids or students in daycare or classroom. Personalized lunchboxes can store snacks or medicine. 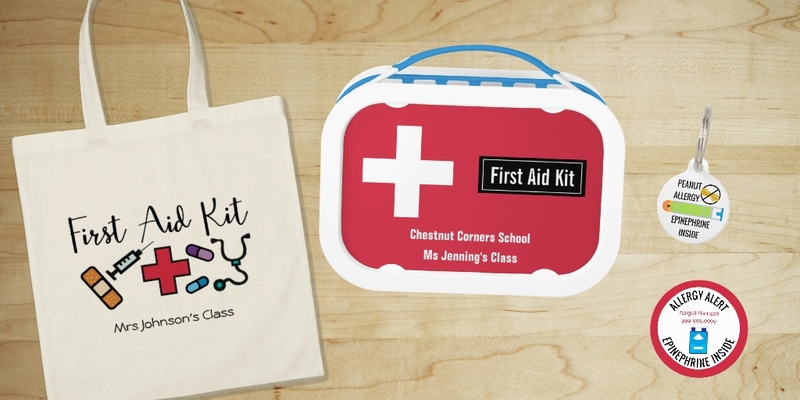 Use for first aid kits at home or in the classroom. Keyring tags are great to attach to lunchboxes, medication kits or bookbags. Any questions or design requests please contact me!